After only three days of snowmaking, Wachusett Mountain opened to skiers and riders on Black Friday. Opening day included Ralph’s Run and Challenger trails, and the summit chair, as soon as the snow coverage on the Conifer trail was adequate. This early start to the season was made possible by the new and powerful technologies that the mountain has incorporated, called the X2 Snowmaking Project. Computer-controlled technology and a new pump house were added to the older snow making system for the 2016-17 season. This project doubles the pumping capacity, going from 4000 gallons per minute to 8000 gallons. The system can cover two trails overnight with all natural snow and no artificial ingredients. The Minuteman Lift’s Ralph’s Run now has 40 computer controlled HKD Tower Guns, capable of monitoring temperature and humidity to create the highest quality product. The $2 million dollar investment has been the largest improvement towards snowmaking in Wachusett’s history. Other technological advances include a new pass system called E-Z Pass, an electronic pass-checking system. If you purchase a Gold, Silver or Bronze pass to Wachusett this year, you will receive a small card to tuck inside your jacket. No strings attached, literally. The gate installed in the lift line will sense your pass as you slide through, so no manual check is required. Wachusett is at it again with new technologies to keep skiers and riders safe and happy! In addition to the improved conditions, the MBTA opened a new commuter rail just 10 minutes from the mountain. This rail will go from North Station in Boston all the way to a new Wachusett Station. A special train car will be designed to carry ski and ride equipment, and Wachusett shuttle buses will be run between the mountain and station all season long. 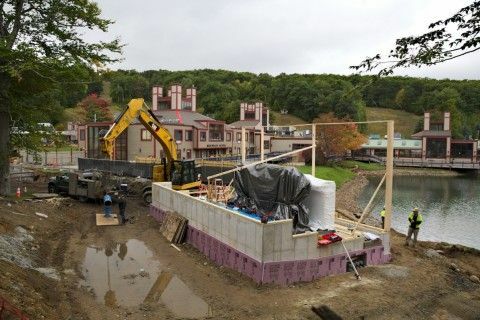 Revenue is projected to be higher than previous years and the owners of Wachusett Mountain and Polar Beverages, the Crowley family, are excited for the upcoming season. Think snow! Nice job, Charlotte! I didn’t realize they had gone to a new pass system or were that close to the new commuter line. Both are good ideas.